Noongar language - the language of the whole SW region of Western Australia - is endangered. Language is about belonging - feeling connected to place and through time. We invite you to be part of the revival and preservation of this ancient language by supporting out Noongar Songs in Schools Project. The Noongar Songs in Schools Project began because teachers with no knowledge of Aboriginal languages wanted help with introducing songs and culture into the classroom. They see a link between celebrating indigenous culture and a more positive attitude to learning, for many students. A joyous way to do this is through singing local Noongar language songs together. Madjitil Moorna Choir, with the strong support of Noongar Elders and through its Music Directors, is in a unique position to help with this learning. Young Noongar performers are mentored as they go into schools and teach songs in language to a new generation of kids. Some teachers are uncertain about where to start, anxious not to offend. They are very capable of teaching songs from books and recordings but a visit to their school from young Noongar musicians who are confident in their culture is a wonderful gift. Teachers want Noongar-led music workshops in their schools and Madjitil Moorna Choir wants to share the singing of Noongar songs with a massed choir of hundreds of children. The first opportunity for this is at the choir's 10th Kalamunda Zig Zag Festival on October 25 - just 3 days away! We feel confident that there will be many more opportunities for performance once the songs are known. MM is very proud to be part of the revival and preservation of this ancient language through the Noongar Songs in Schools Project. We'd love to have your help to fund this ambitious project into 2016. For nearly 10 years Madjitil Moorna choir has been learning Aboriginal songs. Madjitil Moorna means 'magical bush sounds'. Led by award-winning Aboriginal and Torres Strait Island performers, the choir has built a strong reputation in the community and has performed widely across the Perth Metro area and regionally. Have a look at who we are and what we do. 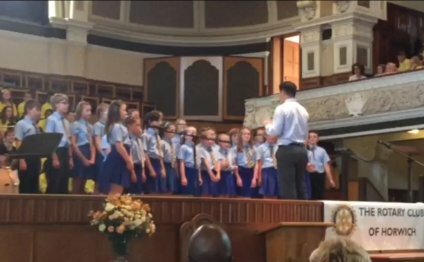 Increasingly the choir is invited to teach children language through song. Early this year, MM produced a songbook and CD, a resource for primary schools. This has been warmly received and has stimulated the appetite for more Noongar cultural inclusion. MM is very proud to be able to help with the preservation of language. Four songs in Noongar plus the 'Halls Creek Rodeo Song' (written with kids in the East Kimberley) from Madjitil Moorna's Songbook are being taught to hundreds of kids across the Perth metro area. Right now four young local Noongar musicians are giving workshops in schools, mentored by experienced facilitators from Madjitil Moorna. Teachers are keen to tap into this new and effective resource that they see can enhance their teaching, across the curriculum. Once started, teachers will continue to rehearse their choirs. Each school will learn a set of 4 kwobidak (beautiful) contemporary Noongar songs for the Festival. They include a lullaby, a chant, an anthem and another little song which is being sung loud and strong across Noongar country. It's Gina Williams' song 'Wanjoo' (Welcome) which she has gifted to the world! Our project is helping Gina to spread this winning song in schools. Many already have it as an assembly favourite. Maybe you'd like to learn it! Two hundred excited children from 10 schools across the Perth Metro Area will sing together with the adult choir, led by the dynamic Candice Lorrae, MM music director and supported the young workshop presenters, teachers and families! reflecting the history of this unique Perth Hills community. For Madjitil Moorna's 10th festival performance, the Noongar story will be woven through an exciting Finale Concert at dusk - just as the Zig Zag Street Parade is welcomed into Stirk Park, Kalamunda - featuring collaborations between Madjitil Moorna and local bands and choirs and including the Children's Massed Choir, singing Noongar songs. This is a first! Never before in Perth has Noongar language been sung by a combined schools choir. It's full circle for Madjitil Moorna. We began as a community arts project run by ZZCA back in 2006. It's good to be looking back over the years and working with the Zig Zag mob again, to bring Noongar culture strongly into this year's program! By donating to this project, you are enabling aspirational Noongar role models to go into schools and prepare choirs for the Massed Choir performance at the Zig Zag Festival. We need $2000 in order to pay the workshop presenters as well as other Noongar artists who will add to the Noongar cultural infusion at the Festival - singing, weaving, dance, didgeridoo and story-telling. With Madjitil Moorna entirely run by volunteers, 100% of funds raised will go towards supporting Noongar artists and the spreading of Noongar language through song.